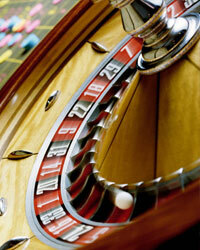 The most popular and commonly played type of roulette online is European roulette. The game's aim is to be able to guess which number on the wheel the ball will drop on. You will then proceed to place a bet on your guess. Once all of the bets have been placed, a tiny white ball is then released into the spinning wheel. The ball will eventually stop on a numbered pocket of the wheel. With inside bets, the player can bet on any number on the table. Straight bets, also known as single bets are part of a type of betting category in which the player guesses what number the white ball will fall on. Split bets (sideways and upwards, also known as two-number or Double bets) are part of another type of betting category in which the player bets on numbers that are beside one another on the table. Another type of betting is the street bet, in which the players bet on any 3 numbers on the table that are positioned in a row. Square bet (also called the four number or box bet) is a type of betting in which players bet on blocks with four numbers. With outside bets, players can choose a betting option that is on the table's outer region. With column best, a player can bet on the white ball dropping on any number that is within a column on the table. With dozen bets, players can bet on the white ball dropping on any number as long as it is within the rows of the table. Even-money bets refer to a type of betting category in which players bet on the white ball dropping on any number from a part of the table, such as either evens or odds, or black or red numbers.